Water management in the oil and gas industry has proven a top concern among drillers and environmentalists alike. Well-owners are concerned with maximizing profits, while communities focus their efforts on public safety and water resource management. With water at the forefront of so many conversations, the right way to address the issue is to enact a smart water management strategy – a strategy with water recycling at its core. Ecologix’s patented Integrated Treatment System (ITS) for frac water management eliminates storage and transportation costs of produced and flowback water by treating the water at, or near, the well pad. The ITS includes temperature controlled chemical mixing, dissolved air flotation, clarification and integrated PLC control systems. 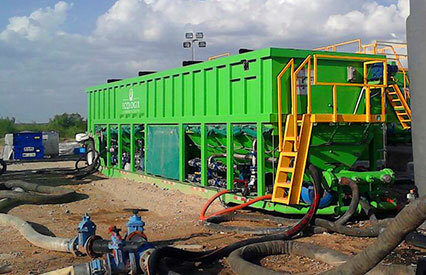 These reliable technologies, backed by experienced personnel, are easily deployed for immediate on-site treatment to improve water management operations. The 900gpm Integrated Treatment System is a complete mobile solution, engineered with frac water treatment at its core. The ITS process is founded on technology first used in wastewater treatment applications for the food industry. This unique adaptation of Dissolved Air Flotation (DAF) technology on a frac tank chassis makes recycling flowback and produced water economically competitive with fresh water sourcing and disposal.